VaR and Approximate VaR in the GO-GARCH (NIG) model. 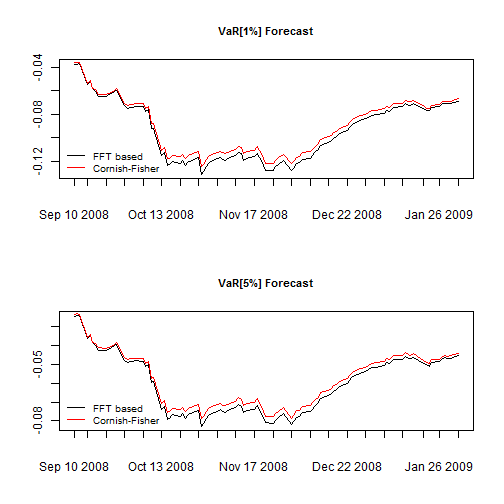 This demonstration illustrates the calculation of the weighted (portfolio) VaR in the GO-GARCH (NIG/GH) model using both the semi-analytic convolution of weighted densities method as well as the Cornish-Fisher method using the weighted co-moments generated by the model. I am going to use the same setup as in the CAPM demonstration, so refer to that for more details. The two are quite close, and I suspect that with a larger number of assets, the two will be much closer as the weighted distribution approaches the normal.